No matter what sort of storm damage your home or business might encounter, the experienced, knowledgeable specialists at Thomas Quality Construction can handle it. 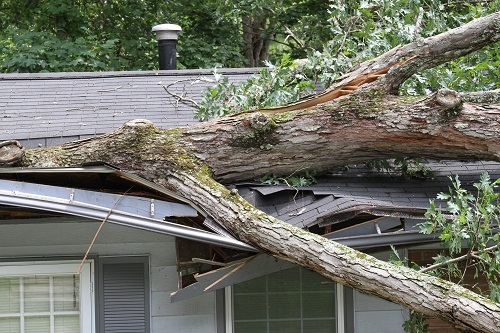 Extreme storm damage can devastate a structure and create a need for emergency roof repairs, along with other repairs to your home. Severe weather is unpredictable in Central Kentucky. Spring and fall often create the most severe storms and thunderstorms. Even the best built houses or commercial properties can take on damage from severe weather. The specialists at Thomas Quality Construction work hard to help people recover from storm damage wherever or whenever harsh weather hits in Central Kentucky. Thomas Quality Construction emergency services specialists have helped locals with storm remediation in days after dangerous storms have hit. Our team is ready for emergency help and estimates on storm damage recovery. Whether the damage is major or minor, you can count on Thomas Quality Construction to repair your home or business. We also assist with the insurance process and offer storm remediation quotes. Thomas Quality Construction is at our best when Mother Nature does her worst. Call us for fast, expert emergency repair and restoration of your home or business. The saying that you can’t fight Mother Nature is definitely true when it comes to bad weather. Severe storms can damage a house or commercial property in many ways. When the weather clears, many homeowners or business owners find that repair work is necessary in numerous areas. Instead of attempting to coordinate various repairs from numerous contractors, let Thomas Quality Construction manage the process from start to finish. Large storms are generally the main reason for roof and home repair. Storms bombard your roofing from different angles. High winds and rain can prove the final straw for an old or damaged roof and compromise enough of your roofing to require emergency service. Our expert roofers can quickly identify the source of a leak and repair any damage. Storm damage can be the result of intense rain storms, hail or high winds. Hail storms and powerful winds can cause significant damage to your home. Thomas Quality Construction provides expert service to repair your home from any type of storm damage. Thomas Quality Construction offers a complete one-stop-shop for all your storm damage repair needs. From repairing damaged woodwork, damaged siding, damaged roof and more, our storm damage specialists can have your home or business as good as new in no time. Dealing with the aftermath of a storm and the damage it caused can be stressful and overwhelming. Make it simple by working with a company you can trust. Thomas Quality Construction is a trustworthy, dependable company of hard working, dedicated professionals. You can count on us to provide a thorough inspection of your storm damage and give an accurate estimate for your insurance company. When it comes to storm damage repair, nobody does it better than Thomas Quality Construction, covering Lexington, Georgetown, Winchester, Nicholasville, Richmond, Berea, Danville, Harrodsburg Garrard County and all of Kentucky. Thomas Quality Construction is a family owned and operated company. We pride ourselves in the quality of the job and satisfying every single customer.